I was selling at a farmers’ market in an urban shopping center. Two older women (both in their late 60s or maybe early 70s) stopped at my table. Both had nice hair and were well dressed. The taller one was wearing upper middle class casual clothes (not exercise clothes and not beach clothes, but not fancy working-in-an-office clothes either). The second woman was dressed like money too, but her clothes had a younger, more flamboyant style. Her top was colorful and seemed vaguely East Indian. The woman with the more flamboyant style went right for my skull bracelets. She quickly found a bracelet with a small skull on it made from purple and blue variegated hemp. She wanted to try it on, so I fastened it onto her wrist and she seemed to like it. I told her all bracelets were $6 each or two for $10. She continued to look through the skull bracelets. Several times she found one with colors she liked, only to say disappointedly, Oh, but this one doesn’t have a skull. After she said that a few times, I said, Yes ma’am, that one has a skull too. She tried to explain what she meant, and I think she was saying that the carving of the features on some of the skull faces was not as deep as on others. I wonder now if maybe she had eye problems and was having a difficult time seeing the features on some of beads. About that time she asked, How much are these? I wasn’t surprised by the question. Many times people don’t hear me give the price or forget pretty quickly. I just told her again, $6 each or two for $10. She wanted to buy skull bracelets for friends, and I was trying to help her find exactly what she wanted. So-and-so likes pink, so the customer wanted pink hemp, but the skull bead had to be the right size (small), and she was still saying that some of them weren’t skulls, when actually, they were. I was trying to stay patient and upbeat, but honestly, the woman was starting to freak me out. Then she looked at me with total sincerity and asked me, How much are these? as if we had never had a conversation about price. She didn’t say, Tell me again how much these are? She didn’t say, I’ve already forgotten the price; tell me again how much these are. She said, How much are these? as if she had never said it before. I was really flustered. I briefly wondered if maybe I were losing my mind. But I remained calm and told her again, $6 each or two for $10. All the while, her friend was telling her how great the bracelet looked on her, how the bracelet was really her. I got the strong feeling that the woman shopping for bracelets was (or had been) the wild one of the two. Finally the woman had picked out three skull bracelets for gifts and still had one on her wrist. With her decisions finalized, she said to me, I guess you want $20. The price had finally sunk in! Because of her age, I had been feeling sorry for her, thinking she was suffering from Alzheimer’s. When I got back to my host family’s place and told the story to the Lady of the House, it occurred to me that the woman was acting quite a bit like she was stoned. Had those two women been off somewhere smoking a doobie? So I formulated a story about the bracelet woman. In my story, the woman has glaucoma, not Alzheimer’s, which is why she can’t see that some of skulls are actually skulls. Because she has glaucoma, she smokes medical marijuana. I’d much prefer for her to be high and not suffering from dementia. These are the type of skull bracelets the woman liked. 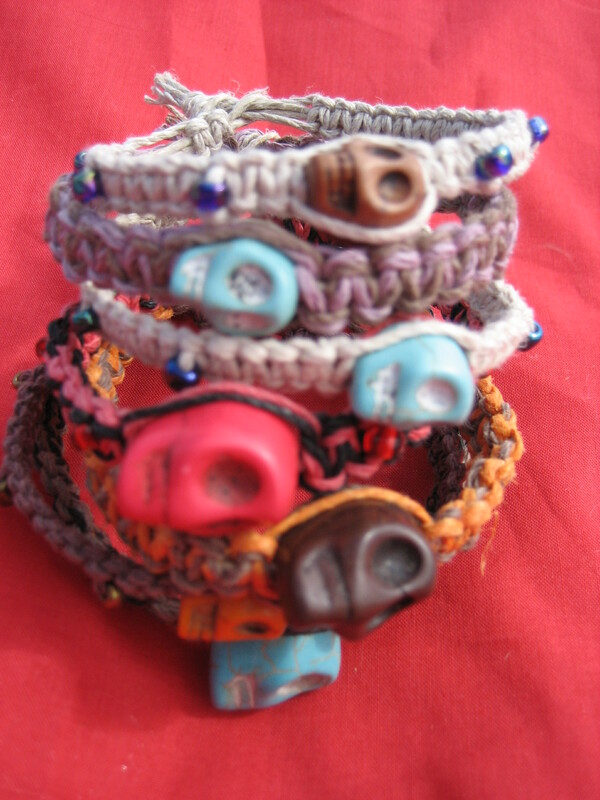 I took this (slightly blurry, sorry) photo of bracelets I made with skull beads on them.